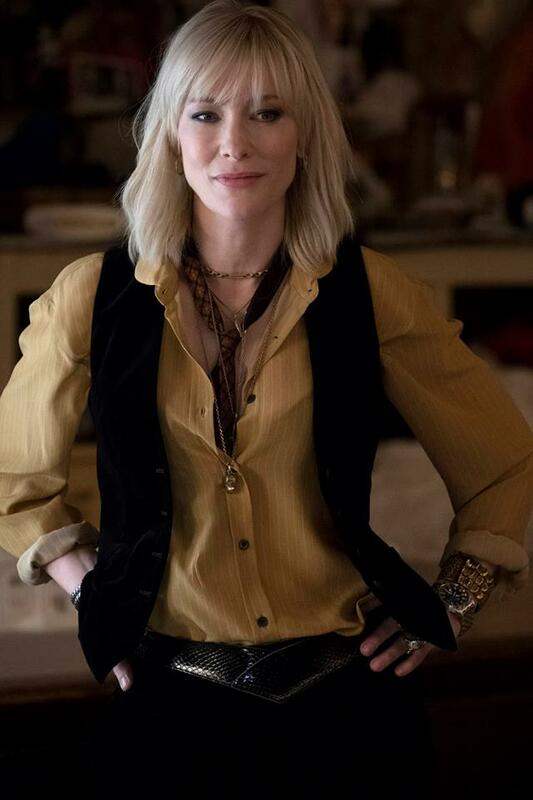 Cate Blanchett stars as Lou in the heist flick "Ocean's 8." HOLLYWOOD—Hey, what if I told you that a new female caper heist was coming to the big screen. Would it be something that would tantalize you as a lover of cinema? Perhaps, but don’t get your hopes too high for “Ocean’s 8,” an all-female version of the popular “Ocean’s Eleven” franchise that starred George Clooney and Brad Pitt. Be fully aware, this movie has an all-star cast of actresses including Oscar-winners Sandra Bullock, Cate Blanchett and Anne Hathaway. However, those ladies alone cannot save this movie in my opinion. Is “Ocean’s 8” a bad flick? No, it really is not. There are entertaining moments and a few surprises along the way, however, if you’ve ever seen “Ocean’s Eleven,” “Ocean’s Twelve” or “Ocean’s Thirteen” you have seen “Ocean’s 8” with the only difference being we have women taking on the roles portrayed by their male counterparts. This time in the driver seat is Bullock as Debbie Ocean, the brother of Danny Ocean portrayed by George Clooney. No, please don’t get your hopes up, because Clooney does not appear in this installment. Debbie has just been released from prison, and it seems brother and sister have more similarities than we could ever expect. They are both con artists, but Clooney’s character is a bit more suave and charming. Bullock is not bad in the role, but its lacking a bit of weight in my opinion. Blanchett, I adore because this woman just eases herself into roles that should appear complicated, but not for a veteran actress. The chemistry between Bullock and Blanchett is a solid selling point in the narrative. As a viewer, you actually believe that Debbie and Lou (Blanchett) were lovers at one point. Hathaway, I felt was actually portraying herself in the movie and with all those rumors circulating about the actress being so polite, prim and proper, this movie didn’t sell me on that. The narrative involves an event that many in the fashion world consider a yearly staple: the Met Gala. Yes, the biggest night in fashion, where Debbie has orchestrated a heist to steal a very expensive Cartier necklace to be worn by Daphne Kluger (Hathaway). The heist is quite complicated to say the least which leads to Lou and Debbie to recruit additional members portrayed by Mindy Kaling, Rihanna, Awkwafina, Sarah Paulson and Helena Bonham Carter. Each lady brings a level of expertise to the heist that is greatly needed to pull off what appears to be the impossible. Will the audience find a level of entertainment with this caper? Yes, but it’s not so invigorating that you consider it one of the best flicks you’ve ever seen. It moves along at a steady pace, but if you’ve seen any of the flicks in the franchise, boredom does creek in slightly. “Ocean’s 8” does what it aims to do, which is give the audience a different perspective on a heist flick with women at the helm. It is indeed empowering, but a few more sprinkles of originality could have made a mediocre film into something a bit more entertaining.